I miss Chinese take-aways: browsing the long menus, taking time to pick from the myriad of choices, imagining the flavours and anticipating the delivery. Vicariously I share these activities with the teen and her friends but have to find something "very important" to do once the food is delivered, or else I find myself questioning them over every mouthful. I've always cooked my own mock-Chinese stir-frys with the constant trio of flavours: ginger, garlic and chilli, but precisely because I used the same flavours, everything ended up tasting the same. Since I stopped eating chillies I have augmented my flavours with star anise, szechuan pepper and other spices which have vastly improved the results, but you can't get away from the fact that they are just vegetable stir-fries. Fuschia Dunlop's books are on my Christmas list but I am too impatient right now to wait: I want Chinese and I want it now! I have just discovered Mary Moh's blog here, Mary cooks Malaysian food and it all looks scrumptious. I was drawn to her blog by the sweets and desserts, especially because Malay cuisine features lots of gluten free ingredients, and therefore lots of gluten free desserts. Whilst browsing, I came across Mary's recipe for Wantan dumplings in turkey soup. I think that wonton soup was the first dish I ever ate at a Chinese restaurant, I remember being captivated by the silky smooth wonton skins floating in the savoury broth. Wontons have been out of reach to me for ages but, remembering that I saw Lye Water (kan sui) in our local oriental store by the station, I decided that wonton skins and soup are the next gluten free step for me. With gluten free wontons, you open up a whole range of new recipes and dishes. Beyond wonton soup, you can also make all manner of dimsum which are otherwise out-of-reach to gluten-free eaters. Even crispy wonton skins make a pleasant change to prawn crackers. However, as you can see from the picture above, I got distracted from my task and decided to make shao mai as I figured they would be on my plate even quicker than wonton soup (making stock from scratch would take just too long today!). 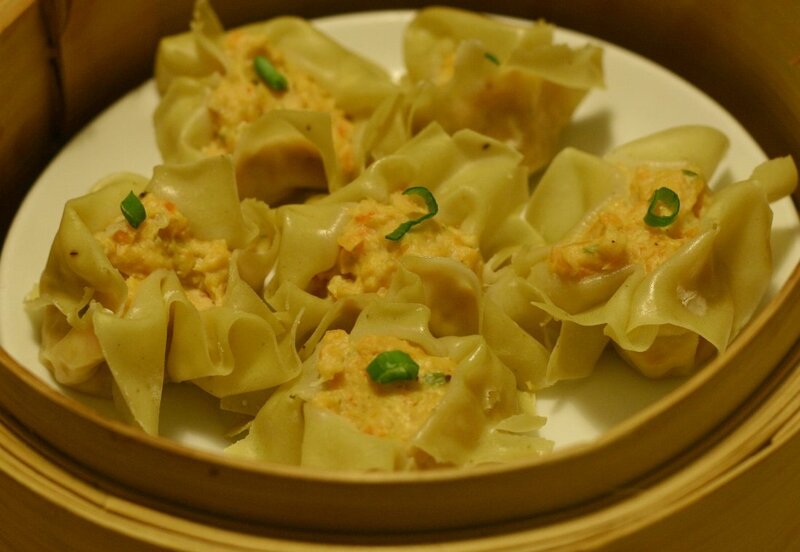 Shao Mai are delicious little steamed open dumpling stuffed with a quick and easy filling. I've made a prawn & salmon filling, but there are plenty of meat versions around on the internet. Make sure that 50% of the protein in the dumpling is naturally fatty - like the salmon in this recipe - this will help keep the filling juicy and soft whilst they steam. Mine are so messy (here is what they should look like!) but they taste great. I was geniunely so hungry and so impatient whilst I was making the dumplings that I just dolloped a teaspoon of filling in the centre of the freshly rolled square skins and squidged up the corners. Luckily they cooked well and tasted great which goes to show that free-style dumplings work too! The basic pasta dough, made with egg and lye water, can be used for traditional style Chinese egg noodles too - adding a little more authenticity for a gluten free Chinese meal. I am not quite sure how these would turn out without lye water. Even a little touch in the recipe adds an authentic smell and chewy texture so do try to find it if you can. process each piece in turn through a pasta machine reducing the thickness each time to create a thin silky sheet. I found the dough become brittle at roller #8 so stopped there. If you are not using these immediately store them in a ziplock bag in the fridge. If you are freezing the wonton, store them flat in a box before freezing. The dough sheets will be brittle and will shatter easily if they are knocked or squashed whilst in the freezer. chop for 30 seconds then pour in the liquid ingredients. that's the filling made - I said it was quick! spoon a heaped teaspoon full of mix onto the centre of the skin and push the corners together so they stick to the mix. I really hope that you have a go at making these. They are fun to make and delicious to eat. This recipe made enough to serve 6 people, so I have portions made up in the freezer, ready for the moment the teen orders her next Chinese take-away. wow....you made your own wantan skins....and non-gluten. I'm very impressed. Your siew mai looks very delicious. Thanks for the mention. I'm glad to know you love Chinese food. Wow that is a labour of love there, you must have been desperate for some Chinese food! Well done they look delicious.